From time to time, during the eight years that “Your Town and My Town” has appeared in the columns of “The Suburban,” the writer has been asked various questions in regard to the drinking fountain that once stood near the middle of the business block. Many would like to know something of the history of this old landmark, and of its ultimate fate. No particular information had been forthcoming, until one day this summer, when Miss Zillah Hale brought forth a collection of old postcards. Among them was the above picture of the fountain. Interestingly enough, the postmark shows that it was mailed from Wayne postoffice 50 years ago, on August 15, 1907. 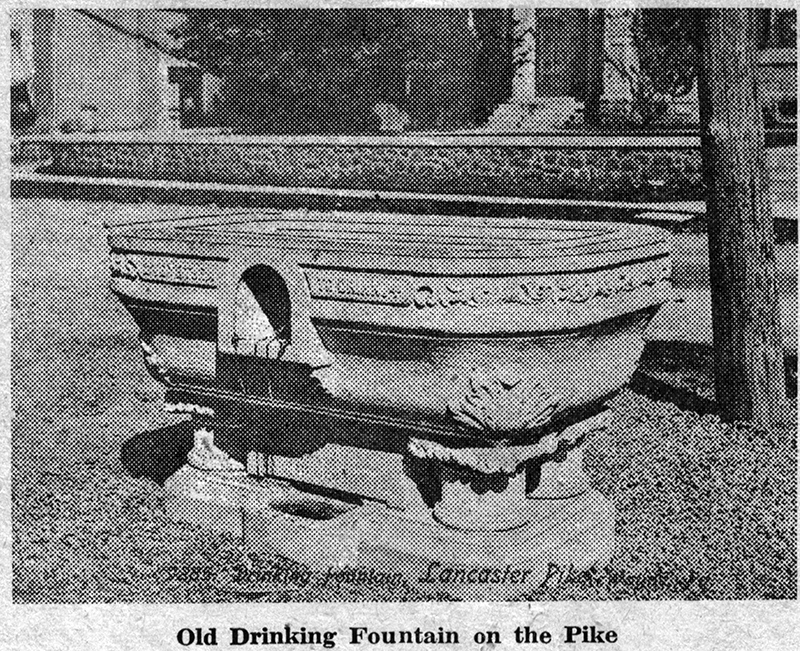 By publishing the picture, the memories of some of Wayne’s real old-timers may bring forth the story of the fountain that can be published in a subsequent column. As to the three functions of the fountain, they are obvious at a glance. The large upper basin was intended for horses and even for the cattle that were driven along the Pike some 50 and more years ago. The small basin, near the base, would be for dogs and other small animals, while the recessed, semi-circular space at the top was for the convenience of thirsty human beings. Even the chains which kept the cups anchored to the fountain are plainly seen in the picture. The gift, whatever its source, was a handsome, if somewhat ornate one for the community, and the purpose which it served was a valuable one in the days when water was a necessity of the road – just as gasoline is now. The Pike was obviously much narrower when the picture was taken than it is now, but the background is little changed. The building almost directly across the Pike from the fountain is easily recognized as the Wayne Presbyterian Church, the cornerstone of which was laid in 1892. If the passerby examines the stores from the sidewalk in front of the church, it will plainly be seen that the second and third stories of many of these stores were once parts of residences. It would be interesting to know whether the fountain was originally placed in front of one of these residences, or at a later date, after their transformation into shops.